Click the button below to add the 2016 Zipp 303 Firecrest Carbon Clincher Rear Wheel to your wish list. The Firecrest shape is probably most dramatic when seen in the Zipp 303 Firecrest Carbon Clincher. 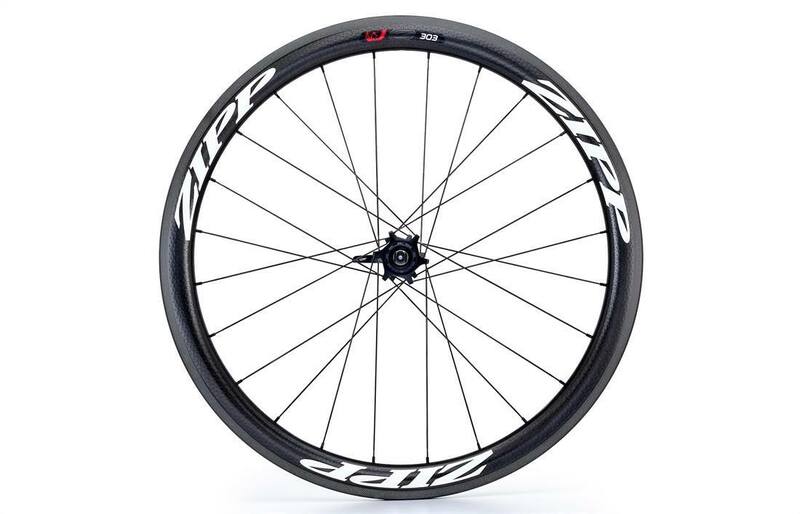 Firecrest is Zipp’s wide-body rim design, which reduces drag both from pure headwinds, as well as from crosswinds. The depth, 45mm, puts the rim toward the shallow end of mid-depth wheels, but it has the drag numbers of much deeper rims, and the side wind stability of much shallower rims. The key is the Firecrest shape. 26.4mm at the brake track but 28.5mm a bit below, and the blunt end on the spoke side, not only cuts through the wind, but also handles cross-winds like few wheels out there. And the wide shape also decreases rolling resistance, improves grip, and even gives you more of an air cushion over rough roads. The width adds comfort and reduces rolling resistance by increasing air volume inside the tire. It’s not only a bigger cushion, but at a given tire width and pressure, deformation over bumps and surface imperfections happens more easily. This is the setup for people who want a serious aero edge on the flats while still climbing very well. And at this weight, it also accelerates quickly and easily. The set weighs in at 1625g, with a 725g front and 900g rear. Zipp has kept the Firecrest shape constant. But to improve the wheel, they had to change the spokes and hubs. They were looking to increase lateral stiffness, which is a plus in front for steering precision, and a plus in back for greater energy transferred to driving the bike forward. They moved on to Sapim CX-Sprint spokes, which are not only super aero, but pretty stiff for what looks to be a skinny blade. The 77/177 hub set is a new offering from Zipp and a real improvement. The pre-load adjustment of the older 88/188 set is gone, simplifying things, as well as designing in lower lateral loading so the bearings roll more smoothly. The front flanges are taller, wider, and hold the spoke in a stronger position. The rear flanges are arranged in a star pattern, allowing for better bracing angles and yielding a strong cross-two pattern and higher spoke tensions. There’s a small, but real weight savings realized as well. For rear wheels, Zipp offers both a Campagnolo-compatible, and Shimano/SRAM-compatible cassette body. The latter comes with a spacer for 8/9/10-speed cassettes. In both cases, the 177 hub body allows you to install a SRAM XD-cassette body for super-wide range gearing. The 303 will make you faster, no matter where you put it and whether it goes in front or in back. That written, matching the 303 front with a 303 rear is common. Some folks will pair the 303 front with a deeper rear, taking advantage of the greater stability of the shallower front in crosswinds. Likewise, some folks will run a shallower front with 404 rear, for the same idea, just in different applications. The wheel is delivered with a Zipp quick release skewer and Zipp Platinum Pro brake pads. Both have been updated: the skewer for better ergonomics and aerodynamics, and the pads for greater surface area as well as cooling. Zipp strongly recommends use of their pads on their rims and warns against using carbon-specific pads on aluminum rims. Also included are Zipp rim strip, valve extender, and Zipp Tangente butyl road inner tube. Zipp has taken innovation in their system to a new level with this tube, which features an aluminum, rather than brass, valve stem. Lighter, better-machined, and possessing a removable valve core. It also improves the balance of the spinning wheel. The wheel is not designed for compatibility with tubeless systems. A small note about the 303 shape. It’s the widest in the Zipp lineup. So wide that the rear wheel doesn’t fit in a few frames. Like the Specialized S-Works McLaren Venge and the 2012 Tarmac SL4. If you think your chainstays are particularly narrow, measure first. The Zipp 303 Firecrest Carbon Clincher is lighter and more aero than most aero clinchers; it kills your training wheels.